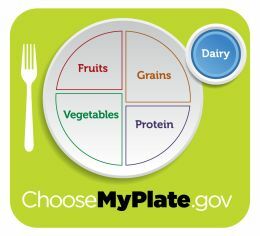 The little blue circle of USDA’s MyPlate illustrates the dairy food group. The dairy group is an integral part of MyPlate’s food and nutrition plan. Make sure that most of your calcium rich dairy products are fat-free or low-fat (1%). What counts as part of the Dairy Food Group? All liquid products derived from milk and foods made from milk comprise the dairy group. Foods that are made from milk and retain or keep their calcium content are also a part of this group. Calcium fortified soy beverages or soy milk is also part of the dairy group. Food products that are made from milk, but have little to no calcium content, such as butter, cream and cream cheese, are not part of the dairy group. How much is needed from the Dairy Food Group? When making a choice from the calcium rich dairy group, select items that are non-fat or low fat. If you usually drink whole milk, switch gradually towards fat-free milk (skim). If you don’t or can’t consume milk products, choose lactose-free products or other calcium sources. The amount of intake from the dairy group is determined by a persons’ age, gender and level of physical activity. Typically for children, girls and boys, under the age of 8, the recommended daily amount is 2 -2 ½ cups. For girls and boys over the age of 9, and men and women, 3 cups is the recommended daily amount. Foods from the dairy group offer nutrients that are essential to health and maintenance of the body, especially calcium, potassium, vitamin D and protein. Dairy products are the preeminent source of calcium in most Americans’ diets. Calcium is helpful for building teeth and bones and in maintaining bone mass. Potassium helps to sustain a healthy blood pressure. Vitamin D plays an important role in maintaining the right levels of phosphorus and calcium, to build better bone mass and density. There is a number of health benefits associated with the consumption of milk, particularly when it comes to a person’s bone health. A diet rich in milk products can reduce the risk of low bone mass throughout the life cycle. You can improve your bone mass if your diet provides you with the recommended 3 cups or the equivalent of milk products per day. Health benefits from dairy include the possible reduction of bone issues such as osteoporosis as well as the risk of reducing health conditions such as type 2 diabetes, cardiovascular disease, and lowering blood pressures in adults. Include calcium fortified soymilk or soy beverages or milk as a beverage with your meals, particularly if the milk is low-fat or fat free. Add low fat or fat free milk instead of water to hot cereals and oatmeal. Have fat free or low fat yogurt as a snack. It is already pre-packaged in most instances and can be quick and convenient. Make a dip for vegetables and fruit from yogurt. Put low fat or reduced fat cheese on top of casseroles, stews, vegetables, and soups.